Technology advancements have created the opportunity for organizations to better cope with the challenges facing the healthcare industry. AI, in particular, is finding multiple applications in healthcare – from diagnosis to treatment recommendations to data management, and many more. 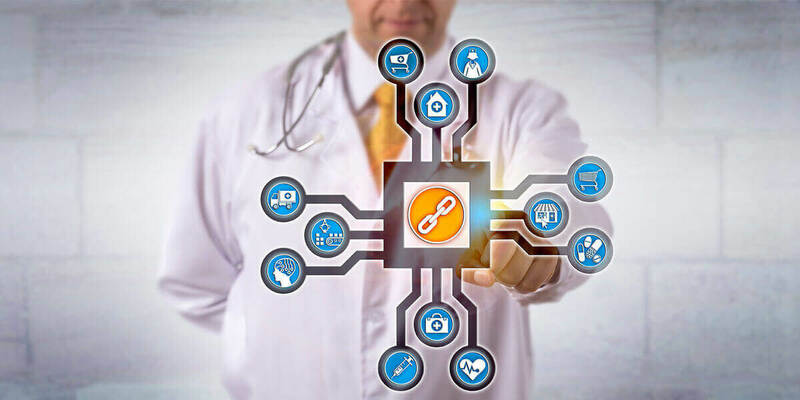 According to an analysis by Accenture, key clinical AI applications when combined could create annual savings of about $150 billion for the US healthcare economy by 2026. That explains the growing investment in AI-based healthcare startups. According to CB Insights, more than USD 2.14 billion of venture capital has been invested in healthcare AI companies in the past 5 years across 300+ deals. In fact, healthcare is believed to have the highest number of VC-backed artificial intelligence startups. Here’s a closer look at how AI startups are transforming the healthcare industry. The ability to analyze large datasets quickly and accurately using AI has opened doors to a number of health analytics startups that are exploring the depths of medical data goldmines. Companies such as CloudMedX and CareSkore are using AI to unlock key outcomes, such as predict the occurrence of disease, identify patient recovery factors, prevent risks, design customized treatment plans and more. AI and machine learning platforms, such as 22 Days and FitGenie, are helping people eat right by utilizing data on individual food preferences, nutritional value, and research on diet and nutrition. These platforms offer a variety of solutions such as personalized meal plans, real-time food nutrition recognition, and voice-based fitness advice, among others. Mental illness, though a global challenge, is common and a costly condition. Research shows that nearly one in five US adults lives with a mental illness. Advancements in AI can be a game changer for millions of people suffering from mental illnesses. Chatbots resembling instant messaging services and natural language processing can identify patterns and reactions to help with customized treatment. Gartner predicts that 50 percent of the population will rely on AI-powered “virtual personal health assistants” by 2025 for their primary care needs. These consumer-facing voice assistants will be at the core of interactions, facilitating health objectives and alert in emergent situations. Thus, avoiding unnecessary visits to the hospital. As part of health monitoring, the increasing use of wearable health trackers – like FitBit, Apple, etc. monitor varied parameters and alert the user. This tracking with AI systems can be shared with doctors who can use this information to analyze the patient’s health status and treatment. Wearables and instruments help evolve from mere fitness tracking to an overall health check. These instruments can analyze blood in real-time in barely twelve minutes. AI capabilities also address several aspects of clinical trials. The cost of failure in drug development is enormous. According to industry association BIO, less than one in 10 drugs win approval, which is a key concern for pharma firms as well as end consumers who consequently pay the price of expensive drug development. With AI-based platforms, pharmaceutical companies can increase success rates and drastically bring down costs by accelerating the process of drug discovery. A wave of AI-based healthcare startups such as Numerate and BenevolentAI are collaborating with scientists to accelerate drug development by leveraging large volumes of biomedical information. Accurate analysis of medical images is crucial for ident­­ifying and diagnosing different conditions. With the ability to read and interpret images quickly, AI-based solutions are being employed for increasing diagnostic speed and accuracy. 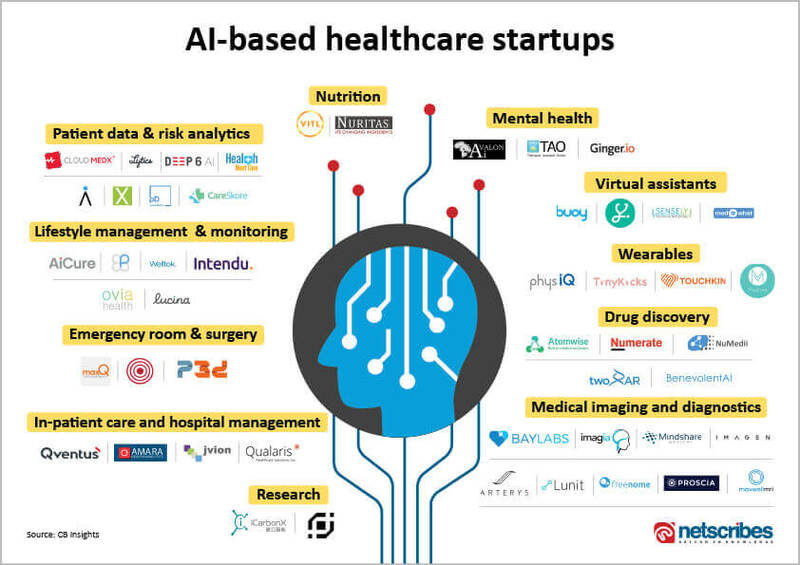 Major healthcare companies are investing in AI startups to accelerate their R&D. Roche made headlines in early 2018 when it acquired Flatiron, a healthtech startup focused on cancer research in a $1.9 billion deal. Timely care is crucial. By using AI-based technologies, patient access can be improvised. With the help of predictive analytics, the AI systems can help healthcare facilities by identifying specific needs and recommending actions to improve patient care. Apart from the patient, AI tools can improve administrative functions by evaluating various operations and predicting issues. Estimated at $40 billion, robot-assisted surgery supports surgeons and allows them to perform with greater control and flexibility, thus reducing errors. Surgical robotics use actual surgical experiences based on medical records to improve techniques for better surgical outcomes. Emergency room overcrowding continues to be an ongoing challenge causing delays in treatment. This is mainly caused by visits that are for non-emergency conditions. AI systems can help predict ER visits to ensure necessary care. With AI-based lifestyle management apps and robots, patients can be monitored on a continuous basis in the absence of nurses and physicians. For example, the AICure app uses the smartphone’s front camera to keep a check on patient behavior in real-time. With advanced facial and medicine recognition capabilities, it can confirm medicine ingestion, thus ensuring patients are adhering to their prescriptions. AI is rated as the most disruptive technology with about 63% of healthcare executives globally having already invested in AI technologies, and 74% supposedly planning to do so. At a time when the global healthcare industry is facing concerns over rising aging population, increasing chronic diseases, and misdiagnoses, AI provides immense promise with intelligent, high-impact applications. A recent study by Accenture estimates the AI health market to explode and reach $6.6 billion by 2021. With its growing potential to better the quality of life and health outcomes and its immense power to enhance the scope of human activity, it could significantly improve cost, access, and quality of healthcare. As consumers seek more transparency, lower costs and improved accessibility in healthcare, embracing the technological wave is critical for overcoming the challenges facing the healthcare industry. Netscribes market intelligence helps companies in the healthcare industry be in touch with the current landscape and what’s expected over the horizon. To request a customized market analysis, write to us at [email protected].